Photo 1. This rider’s seat is unlevel, dropping off on the right side. Notice that the seam of her britches does not line up with the center of the saddle, which is level and in line with the horse’s spine. Next time your ride, sense your two seat bones. Maybe you only feel one seat bone instead of two? Do you sense that you are lower on one side of your seat? Is this consistent regardless of which direction you are traveling? Or does it feel worse when traveling to the right (or left) but still noticeable the other direction? 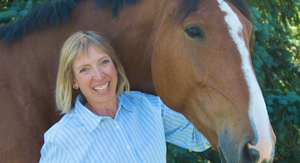 The cause could be one of three things, you’re not sitting level in your saddle, the seat of your saddle may not be level, and/or your horse’s back isn’t level. Photo 2. The rider has placed a folded washcloth underneath her right seat bone. Observe that now she is sitting level on the saddle. Her britches seam lines up with the center of the cantle. There is marked improvement in her alignment all the way up through her shoulders. 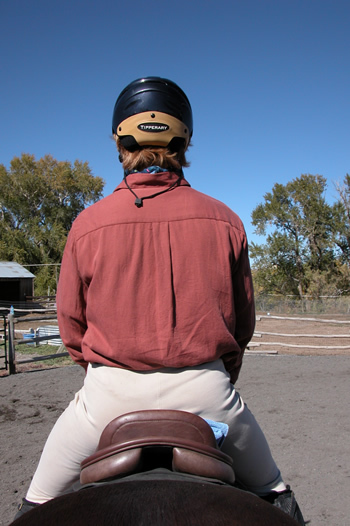 If your horse’s back isn’t even muscled the saddle won’t sit level on his back and you will sit low on one side unless you consciously override this problem. Most of the time rider’s don’t realize what’s happening. Instead they try to adjust themselves over and over. As a rider you might feel like one stirrup is longer than the other. 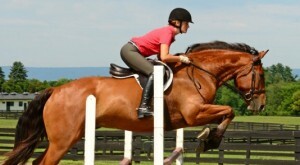 But adjusting the length of your stirrups doesn’t seem to help. Or you might notice that you have worn a dent into the seat of your saddle. Photo 3. 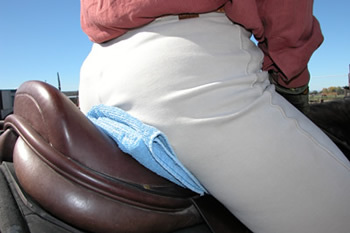 The washcloth under the rider’s seat viewed from the side. You can see that she used several layers. You will have to experiment with how many layers work best for you. 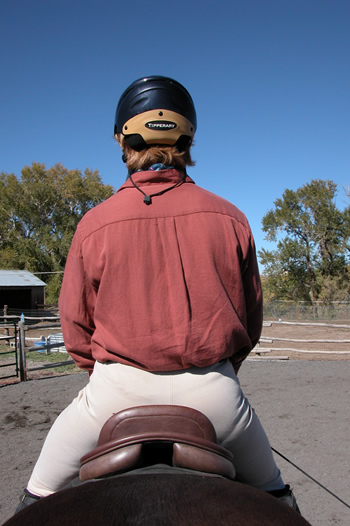 If your or the saddle is the culprit you will notice the same feeling on every horse you ride in that saddle. If the horse is the problem you will notice a change when you sit on another horse in the same saddle. If you are the one who is unlevel the sensations and feelings you observe will be relatively the same even when you ride in different saddles on different horses. Whatever the cause you can help reduce or solve this problem with an ordinary washcloth. Take a washcloth or small piece of toweling and fold it in half. Place it under one seat bone. Ride at the walk (you may lose the cloth at the rising trot). Notice if this feels better or worse. Then double the cloth and test it again. Keep folding the cloth thicker until it feels like you have too much underneath your seat. Then remove it all together and find out what it was like with nothing at all. Do you hold your seat in the “lifted” position? Did your horse raise his back now that you are no longer pushing it down on that side? Or did you fall back into a hole? Repeat the process placing the cloth underneath the other seat bone. Does this feel better or worse? In other words, does it make you feel like you are even more unlevel than when you started? Finally place the cloth what you think is the low seat bone. Find the thickness that feels just right. And ride a bit longer. 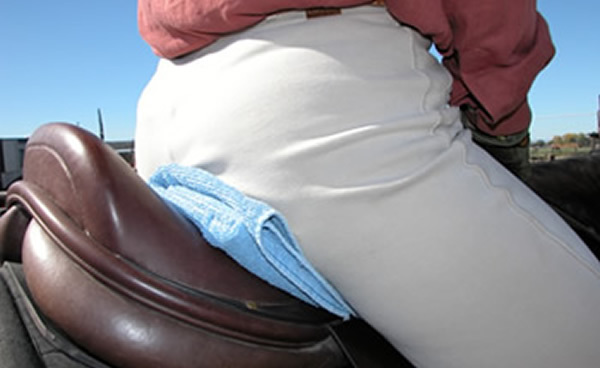 Some students have placed the cloth inside their pants or britches so that they can trot and canter. Be creative in finding a way to keep the washcloth in place. You won’t have to keep the cloth there forever. Once your brain feels the difference you will unconsciously keep the new sense and feeling of a level seat. And of course the difference in your horse will be the best reminder of when you are sitting level. 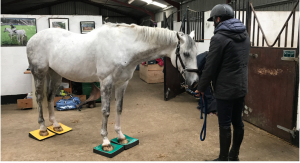 With your seat level your horse will be more responsive, turn better in both directions and even be more willing to lift his back up underneath your seat. Use this Murdoch Minute as a ‘body position self-check’ whenever you feel the your seat isn’t level. At first you might use the cloth every day. After a while you might not notice it anymore. See if you can go without it and have the same positive results. Once a week use the cloth as a reminder that you are still on track. And remember – enjoy the ride!